Off the back of news it’s taken out the prestigious title of ‘Australia’s best beach’ over Surfer’s Paradise and Whitehaven in the annual TripAdvisor ‘2018 Travellers’ Choice’ awards, Manly Beach will be back in the global spotlight this weekend. After kicking off on 24 February, Vissla Sydney Surfing Pro is wrapping up this weekend in Manly, and as Sydney’s biggest international surfing event, the event’s finale seems justified in sharing a date – and a stage – with our beloved Mardi Gras. Aerial shot of Manly, ‘Australia’s best beach’, as voted in TripAdvisor’s ‘2018 Travellers’ Choice’ awards. With Manly abuzz as the Surf Pro continues, it seemed appropriate to highlight the festivities locals and visitors can enjoy throughout the week, while Australian champion – and Manly lover – Joel Parkinson shares his hidden gems for a perfect day at Australia’s best beach. “Brekkie is always by the beach as a surf check is high on my agenda in the AM,” Manly ambassador Parkinson reveals. “Then for lunch we generally opt for healthier options at Bare Naked Bowls and Dolce Terra and then an arvo beer and dinner on the wharf at Hugos to catch the sunset,” he says. From Tuesday 27 February until Sunday 4 March, more than 21 of the world’s leading surfboard shapers will be demonstrating to eagle-eyed fans how they perfectly turn a blank of foam into a surfboard that battles monster waves and helps surfers clock the best scores in the world. From 10am–6pm daily. For the kids and the young at heart, North Steyne will host a kids’ fun zone including an inflatable shark and a mechanical surfboard – cousin to the mechanical bull – on which you can perfect your forward lean. Running from now until the end of the event on 4 March. Saturday 3 March sees a selection of beautiful retro kombis lined up and poised to take Instagram by storm. It’ll also be the centrepiece for a flurry of activity, including a skate competition, pop-up bars and art installations. Close-up of the retro Kombi vans that are part of the Kombi rally. 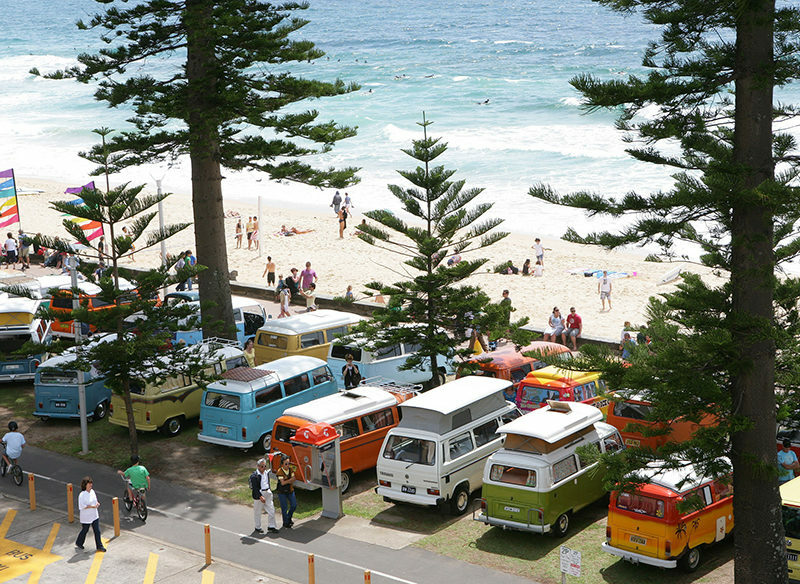 On Sunday 4 May village markets will be held at South Steyne beachfront from 9am–4pm, giving passers-by from the Sydney Surf Pro the opportunity to stock up on both old and new fashion, swimwear and surfing art and memorabilia.